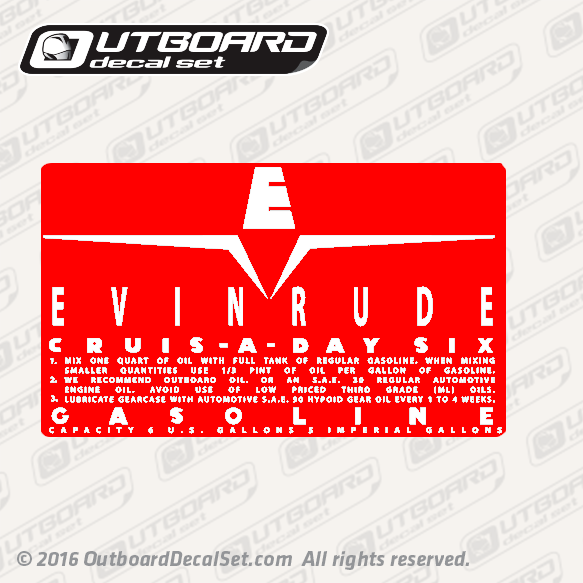 EVINRUDE CRUIS A DAY SIX Gasoline Tank decal replica Sold by Set for 1959 Outboard Fuel Tanks. SMALLER QUANTITIES USE ⅓ PINT OF OIL PER GALLON OF GASOLINE. ENGINE OIL. AVOID USE OF LOW PRICED THIRD GRADE (ML) OILS. 3 - LUBRICATE GEARCASE WITH AUTOMOTIVE S.A.E. 90 HYPOID OIL EVERY 1 TO 4 WEEKS.